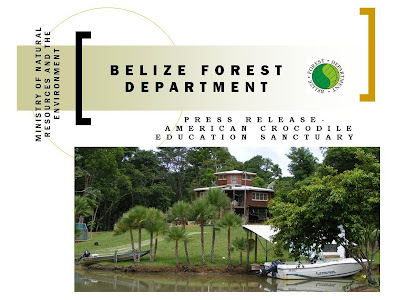 September 29, 2010 - The American Crocodile Education Sanctuary ( ACES) has been working under the Authority of the Belize Forest Department since 2006. The sanctuary was established to provide a refuge to ‘problem’ crocodiles which would have otherwise have to be killed. ACES also rehabilitates crocodiles for release back into the wild and has also conducted research in the south of the country. ACES was first allowed to capture and relocate problem crocodiles from Punta Gorda, Belize City and Ambergris Caye but with increasing reports of problem crocodiles from other parts of the country, the organization was given the authority to respond to such reports along with the Belize Forest Department.ACES has also played an import role in educating locals and foreigners alike on the need for the continued protection of both Morelet's and American Crocodiles in Belize. ACES has been working closely with the Forest Department and have not at any time operated without authorization.